Have you ever heard of a mass kissing ritual, or a ceremony where people voluntarily stab themselves without drawing a single drop of blood? Nope these are not racy orgies, nor some supernatural curse at work. 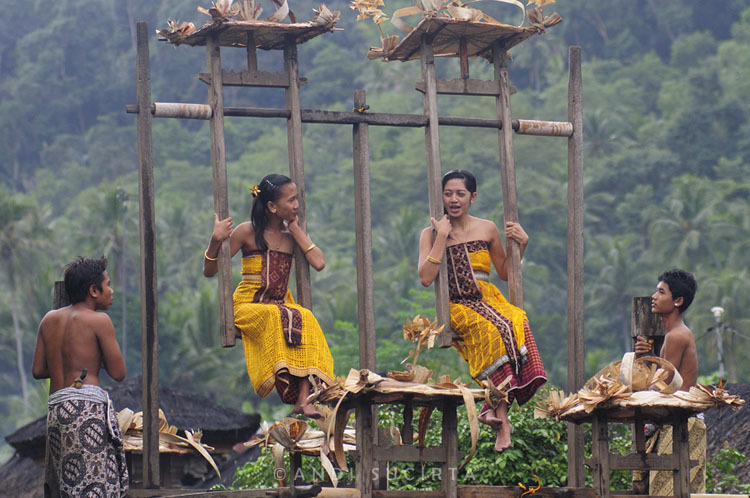 In fact, they are traditions that the locals keep to in Bali. Bali is not just synonymous with beautiful water villas and celebrity weddings.It’s a place steeped in rich culture and tradition, that are often hidden away from the tourist masses. 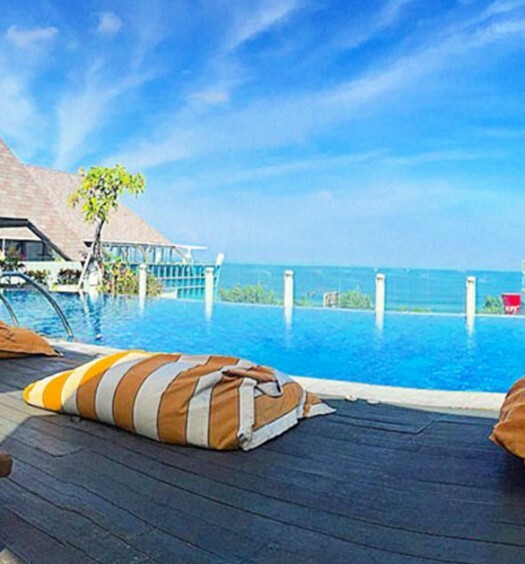 So you think you know all about Bali? Time to think again as we bring you the strangest festivals you’ve ever heard in the land of the gods. If you think the conservative Balinese would be scandalised at the thought of making out in public, wait till you witness this mass smooching festival. 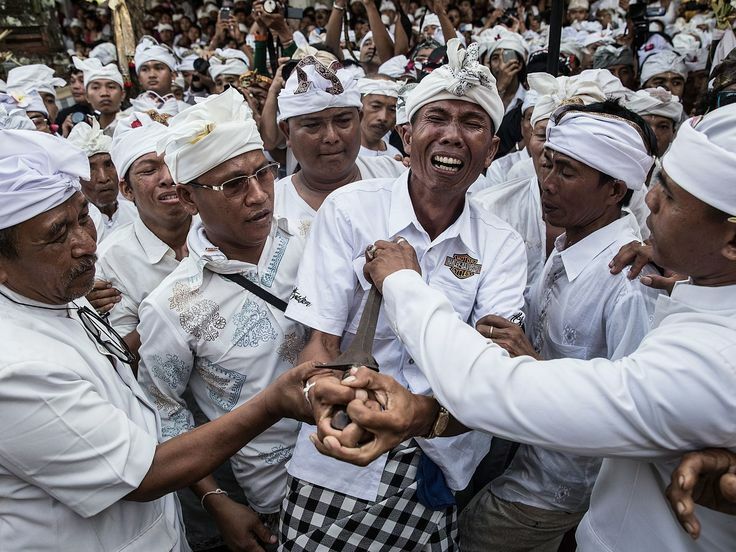 The omed-omedan, which means pulling, or otherwise known as the Kissing Ritual, is a rite of passage the young and unmarried residents in Sesetan, Denpasar go through on the first day of the Balinese New Year (sometime in March). Can you imagine being made to kiss in front of the entire village? 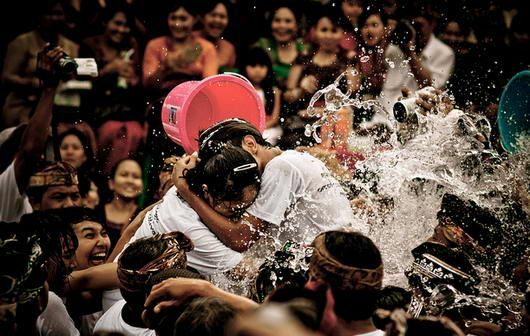 Then, to curb the fires of lust (if you believe the traditions) the kissers are thrown buckets of water! Talk about dampening the mood! Naturally, this is one of the highlights of the year for many local teenagers. Participation is also said to be able to ward off bad luck at the start of the new year. We’re sure that’s just an excuse (and a great way) to find a date. 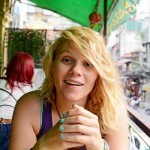 A lady was seen avoiding kiss from a stranger. What do you do to get a girl (apart from the kissing ritual mentioned above)? 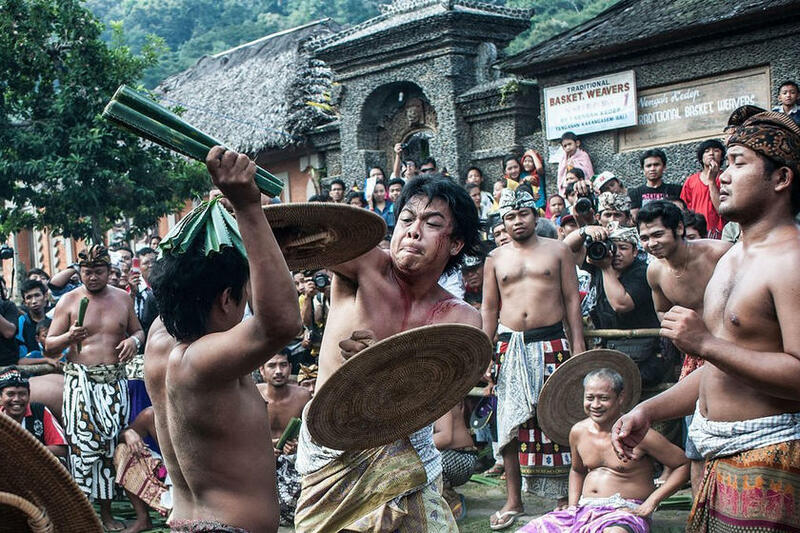 In Tenganan, home to the Bali Aga (the oldest tribal group in Bali), the young men fight it out the traditional way. And they do so to impress the village’s unmarried women. 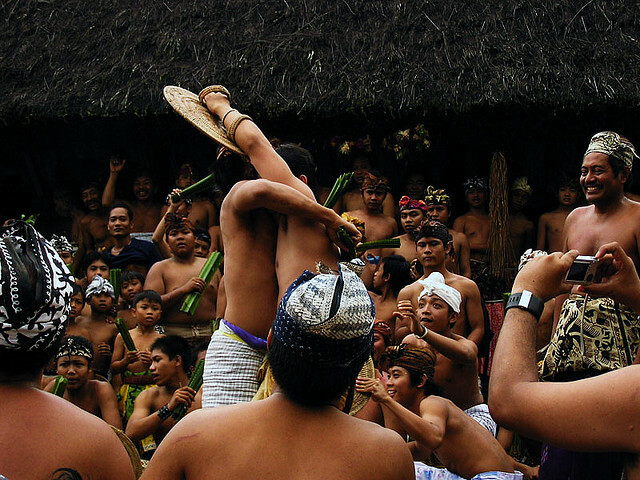 At the Usaba Sambah Festival, which usually starts in May or June, the men start sparring (a fight called makare-kare) with just sharp pandanus leaves and a bamboo shield, guaranteeing both blood and lots of excitement. The ceremony lasts for an entire month, offering up most of the villages’ young blood for the cause. And the girls? They’re paraded before the village on a wooden ferris wheel, powered by the people while wearing their most beautiful ceremonial clothes, another unusual addition to this traditional rite of passage. Talk about matchmaking. How can it get more exciting than this? 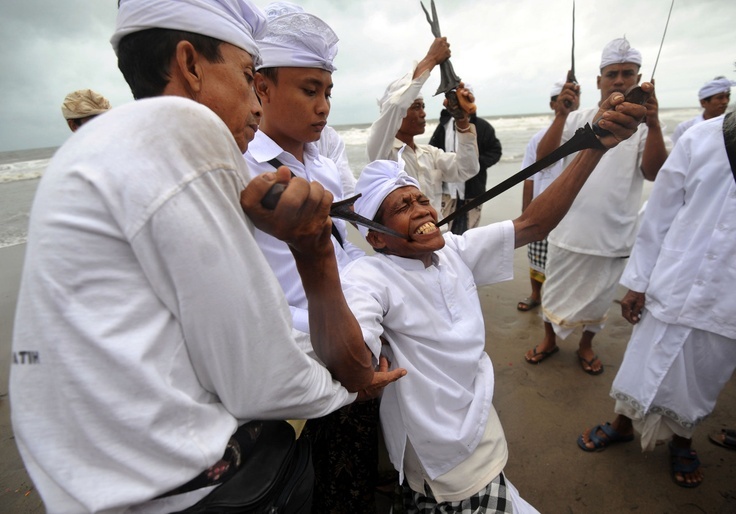 Looks like the Balinese New Year is an exciting time for the locals. Not only do they have kissing rituals, a strangely liberal concept for a relatively traditional and conservative society, but there’s a Hindu purification ceremony as well, which the Balinese call Melasti. Thousands flock to the beaches at dawn to give offerings to Hindu deities, so as to cleanse themselves and their local temple artifacts. 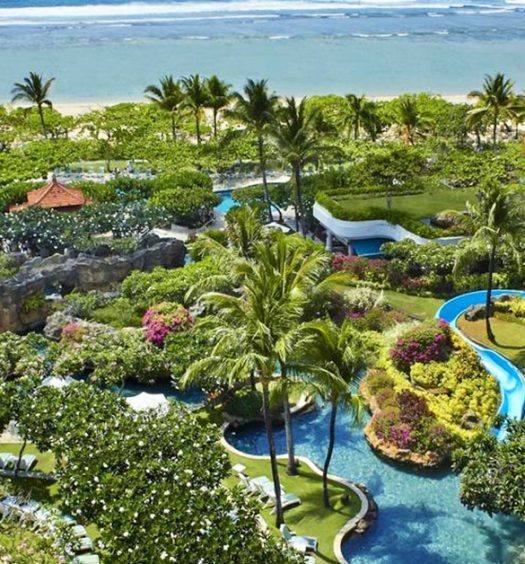 You’d hear a resounding mob of Balinese intoning and praying on the shores all over the island for most of the day. 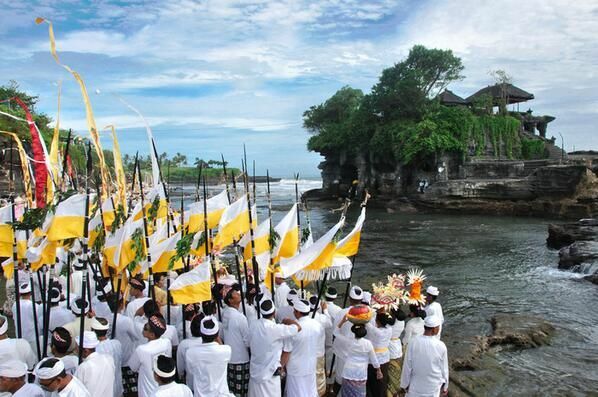 One of the Melasti ceremonies held in the famous Tanah Lot temple. 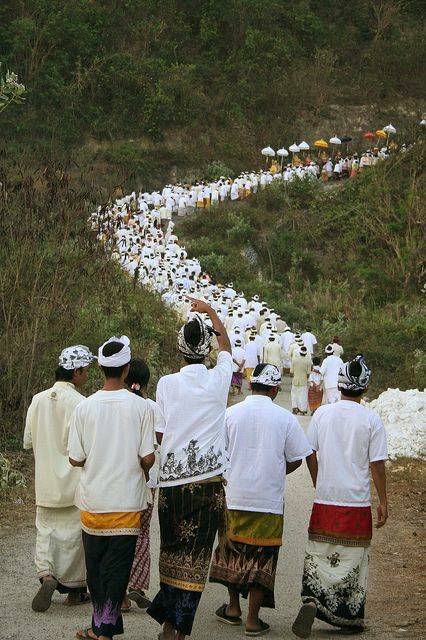 This sea of white traditional clothing, interspersed with the sacred colours of red and black, creates a human canvas that few visitors to Bali would have seen before. Have you ever seen a man fall into a trance and attempt to stab himself, but miraculously without drawing blood? 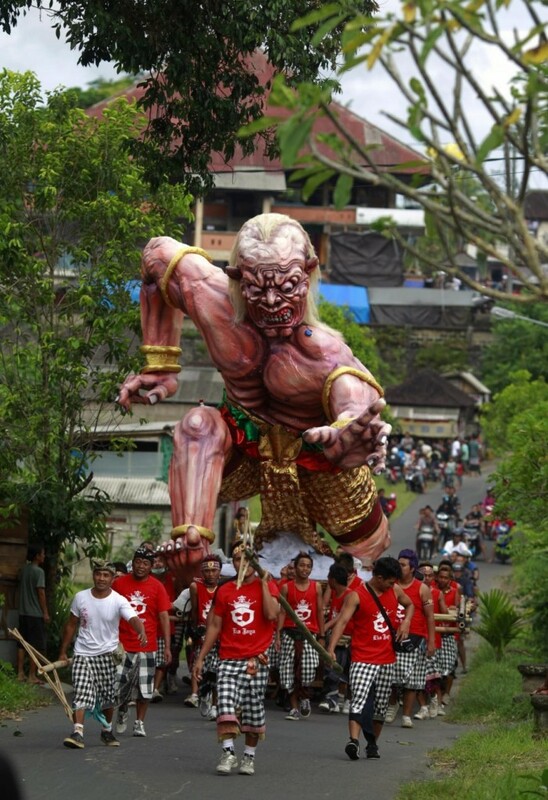 You can witness this in a small village named Kesiman just outside of Denpasar, where the locals have been known to get great protection from the island’s Hindu deities. 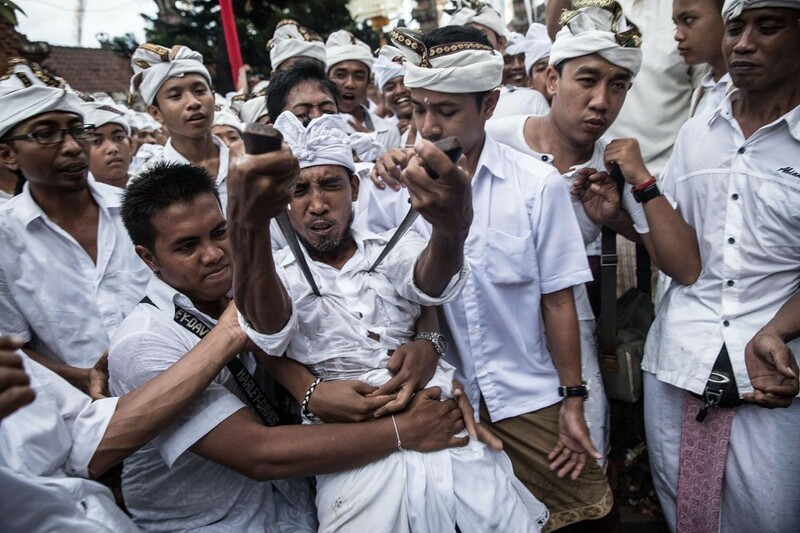 During an intense ceremony called Ngerebong, Hindu spirits are summoned to earth with such a great power that it throws many participants into a trance. While in the trance, with the believed protection of the summoned spirits, the men of the village grab knives and plunge the razor-sharp blades deep into their necks and chests, without drawing a single drop of blood. Some men mysteriously gained so much strength that they even bend the blade against their own bodies. 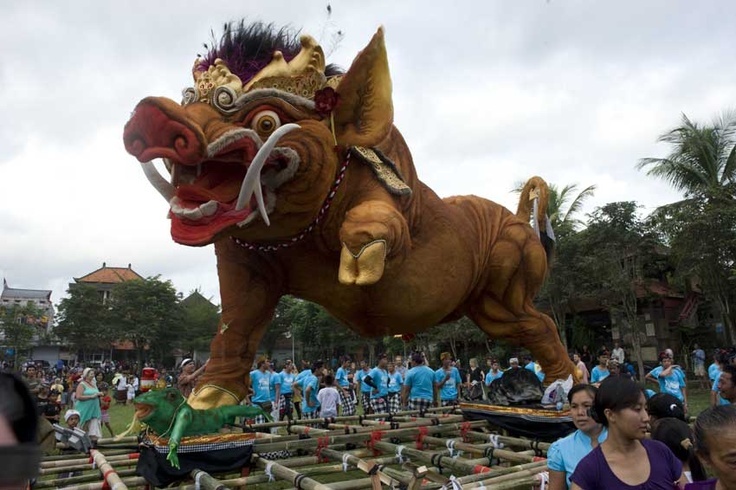 The painful ceremony serves as proof for the Balinese, showing that they are indeed believed to have the protection of the gods, and that the men have brought safety and security to the village. And of course, with all the rituals surrounding the Balinese New Year, how can we miss out that New Year itself (known as Nyepi)? Imagine combing the streets with loud processions and terrifying ‘monsters’ that dance on the backs a hundred men. 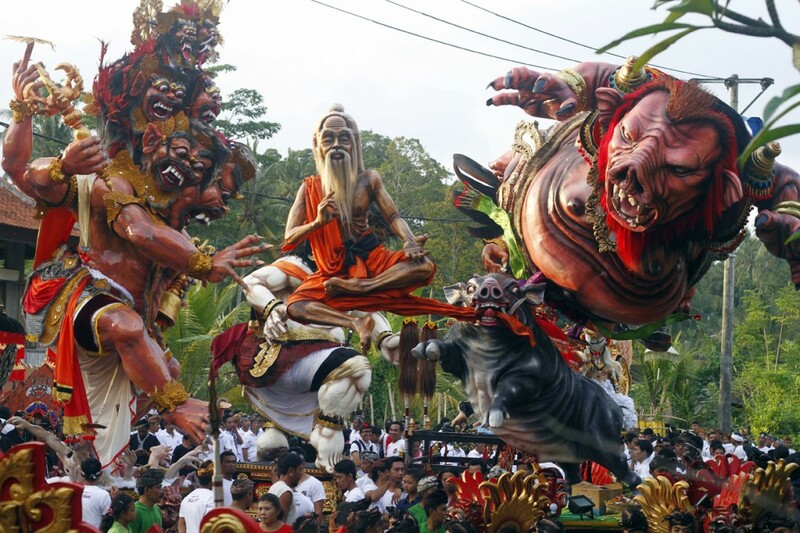 These figures, known as ogoh-ogoh, are meant to scare and drive out evil spirits. They are then ceremonially burnt in flaming pyres. The next morning, the streets would be so quiet you can hear the softest whisper. The Balinese shut themselves in their homes (and without turning on the TV). All the cafes – and even the airport – are closed. It is believed that the evil spirits will then be convinced that Bali is deserted, and leave it in peace for another year. 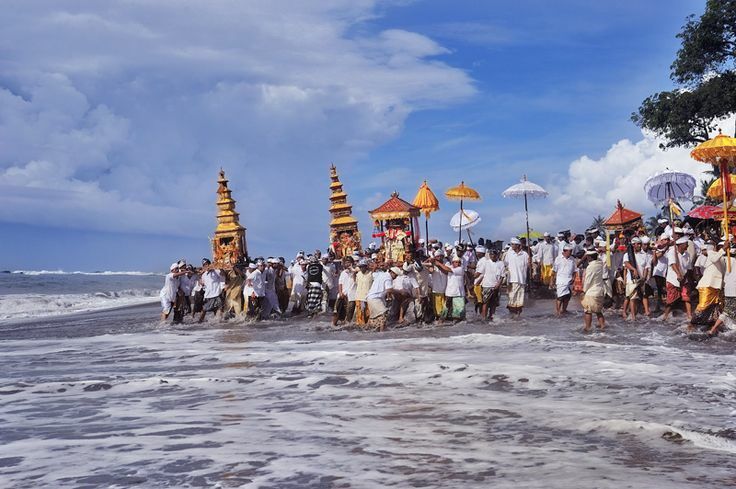 Have you heard of any other interesting Balinese festivals that we’ve missed? Drop us a note below and let us know!